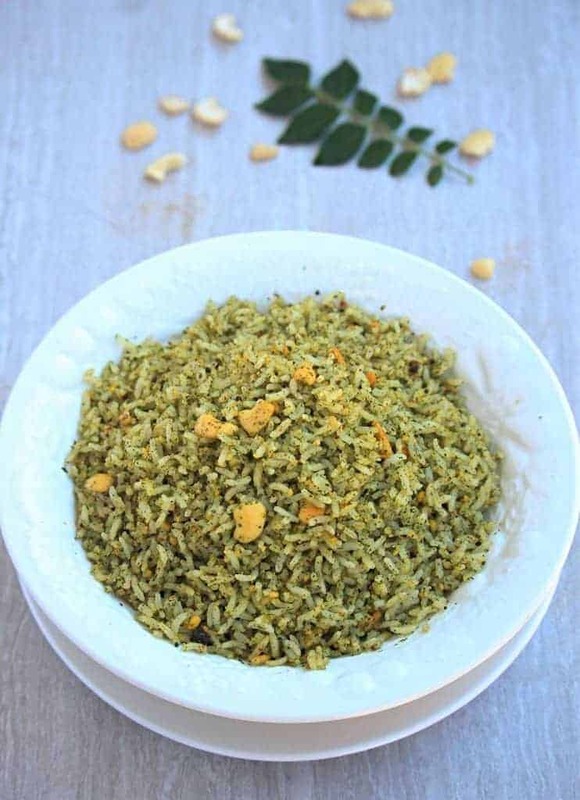 Karuveppilai Sadam | Spiced Curry Leaves Rice tastes even better when made with fresh homegrown curry leaves. A great lunch or dinner option. 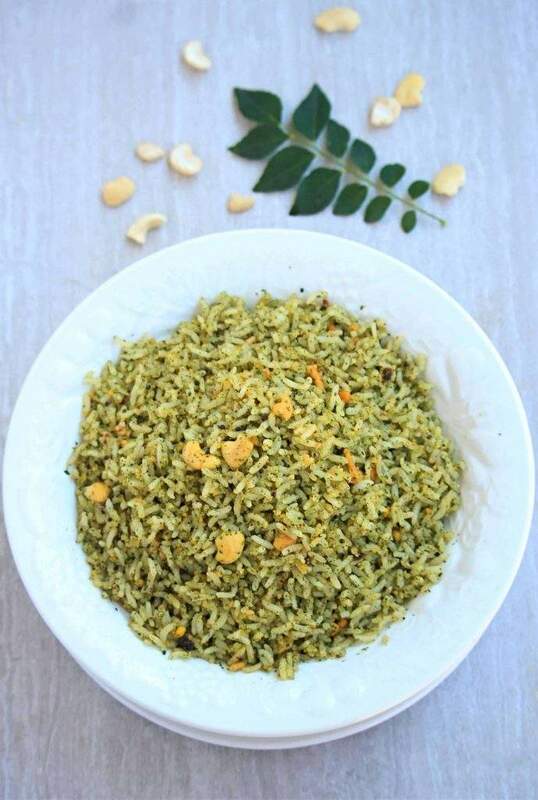 Sticking to the green color, today I made Karuveppilai Sadam | Spiced Curry Leaves Rice to end the theme ‘colorful dishes’. I had many ideas flooding through my mind, but for the color green, I could not get past spinach or cilantro. I have already made many possible things with spinach, so wanted to stay away from it. 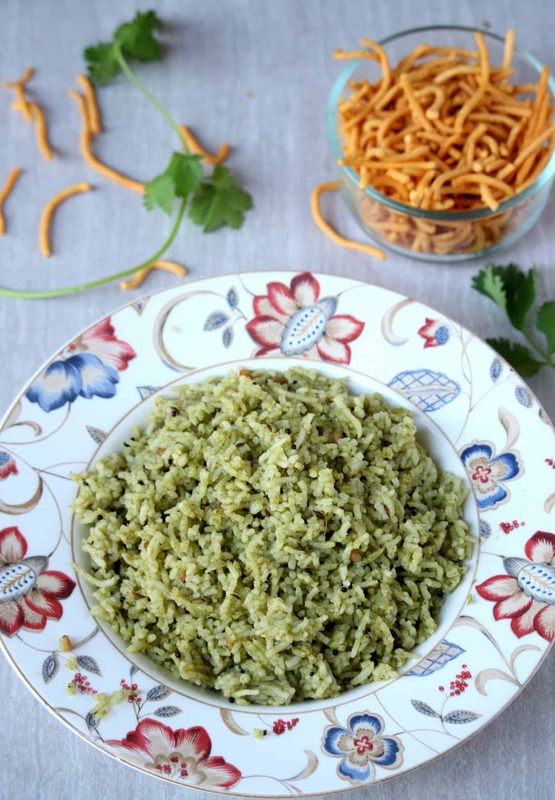 When thinking of using cilantro in a main dish, I could only think of Cilantro Rice which I have already made. That is when I remembered the fresh batch of curry leaves that we harvested from our plant. My Mother in law always made Karuveppilai Podi | Spiced Curry Leaves powder for us when we came back from India. There is a huge Curry leaves tree in the house and there was a never ending supply of curry leaves. 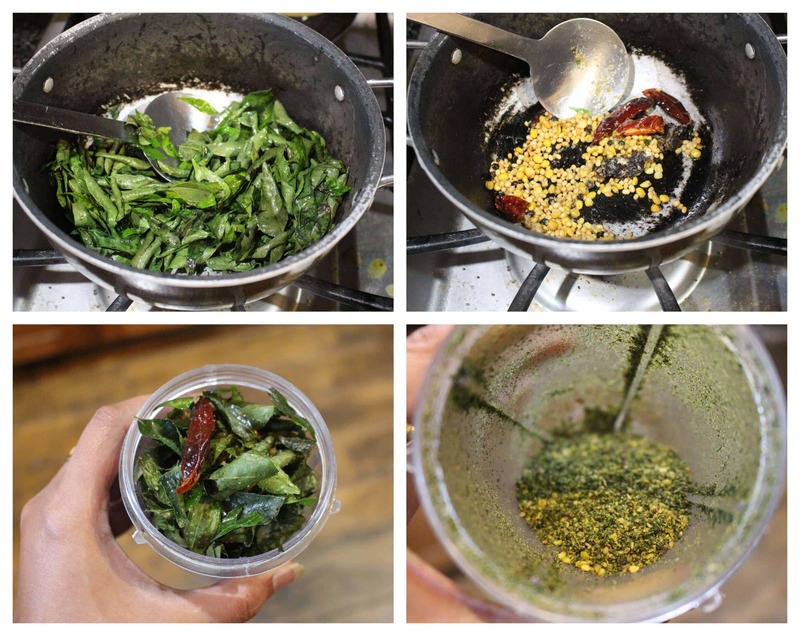 Here in US, if buying curry leaves, it is like gold. They are quite expensive and I have never even thought of using this much of curry leaves to make powder out of it. After 3 years of caring, my curry leaf plant has grown quite a bit. This whole summer, I hardly bought any curry leaves from the stores. We were able to cut branches from the plant to use all summer and just last week, we cut the final large branch off the plant before we let it hibernate for the winter. I had quite a bit of fresh leaves all washed and cleaned. 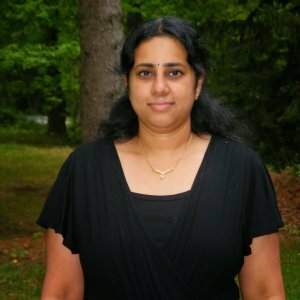 So, I messaged my cousin Uma, who is a expert in traditional recipes and asked for Curry leaves powder recipe. 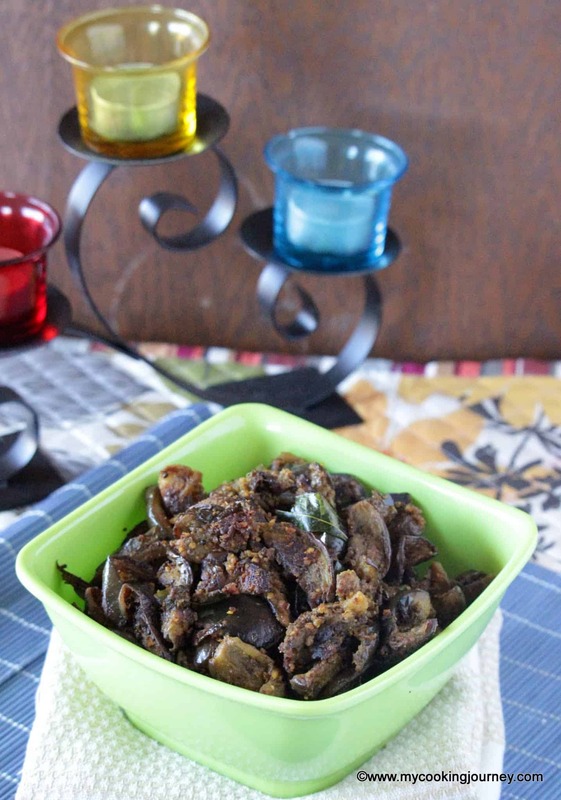 Uma mentioned that she made a big batch just few days back and gave me the recipe she used. Next summer, God willing, if my curry leaf plants thrive well, I will be making a large batch of it as well to store for a few days. For now, I just used one (sort of packed) cup to make and it was just enough for all of us to eat as lunch. Wash and dry the curry leaves well. In a kadai / pan, heat 1 tsp of oil in low flame. 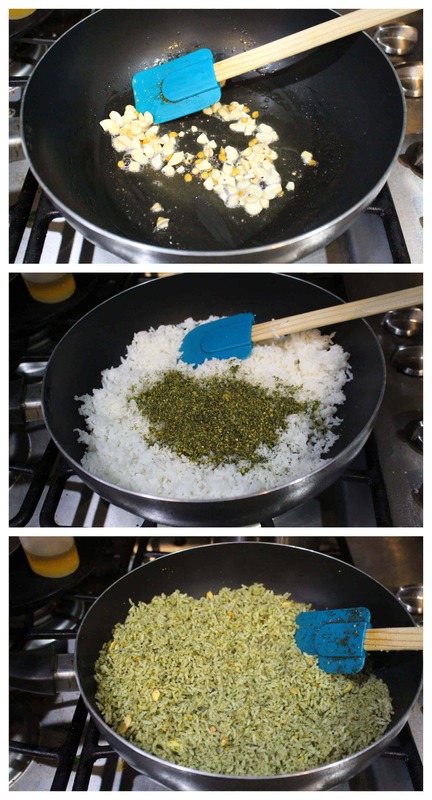 Add the curry leaves and mix well. Keep stirring to evenly roast the leaves. Make sure to do this in low heat. The curry leaves should not change color. It should just fry and become crispy. It will take a good 6 to 7 minutes on low flame. You will notice that the leaves start to become crunchy. 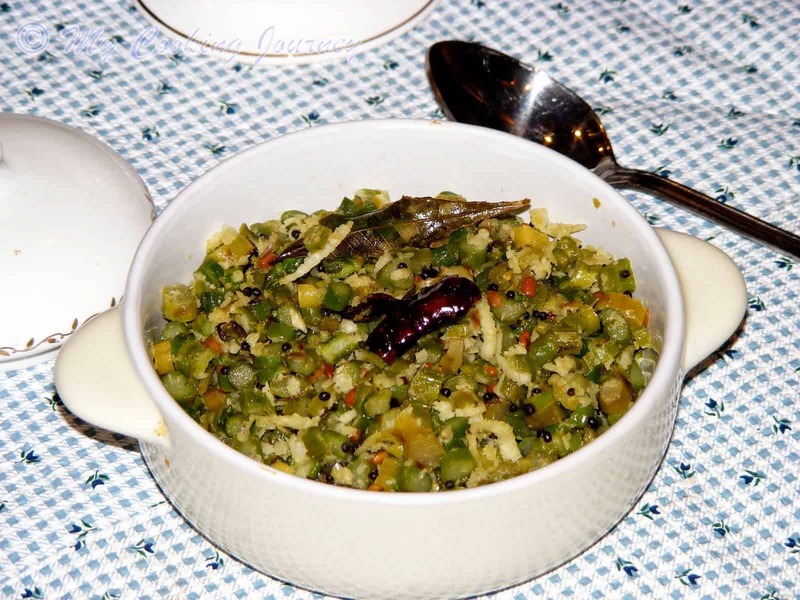 Remove the fried curry leaves in a bowl. 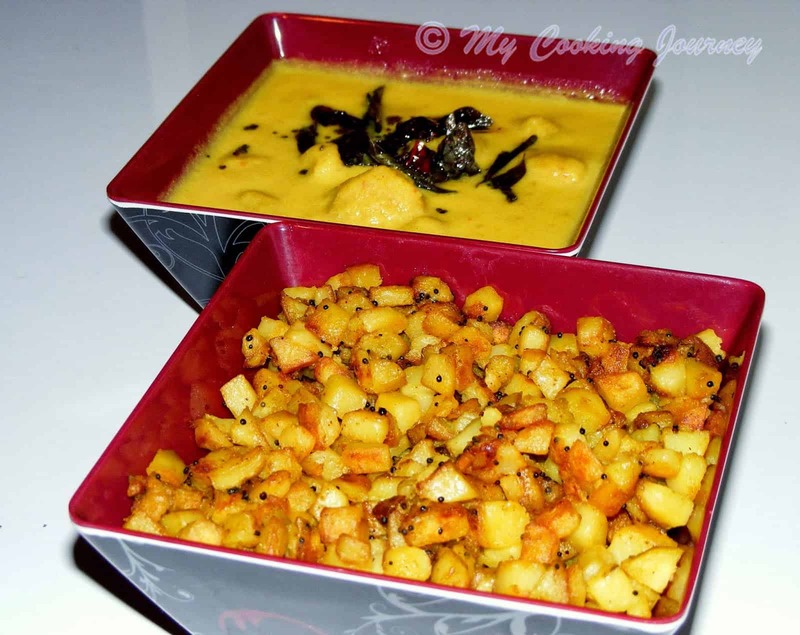 In the same pan, heat one more tsp of oil and fry the Urad dal, Chana dal, Coriander seeds, Red chilies and black pepper. Fry until they are aromatic. Add the Asafetida, salt and tamarind piece at the end and fry for a minute. 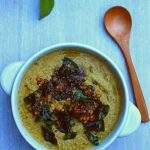 Turn off the the heat and then add the fried curry leaves to the pan and let the whole mixture cool down to room temperature. Grind the mixture to a smooth powder. You can make it very smooth or leave it a little chunky based on your preference. The karuveppilai powder is now ready. This powder can be stored for a later use as well. Cook the rice and let it cool down. I usually add a little oil to keep the rice from sticking. In a wide pan, heat 1 TBSP of gingelly oil and add the mustard seeds. Let the seeds crackle and then add cashews. You could also use peanuts instead of cashews for a different taste. 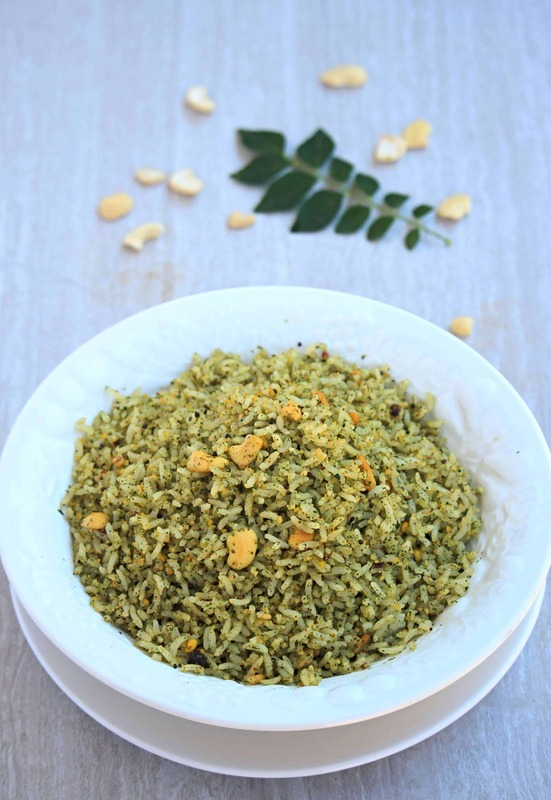 Once the nuts are fried, add the cooked and cooled rice along with the ground curry leaves powder. I used 3/4 of the powder that I ground. Add half of the powder and gently mix to combine. Taste and adjust the salt if needed. If needed, add more karuveppilai powder and mix. 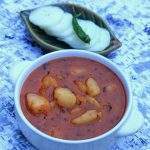 Serve with potato curry or chips! 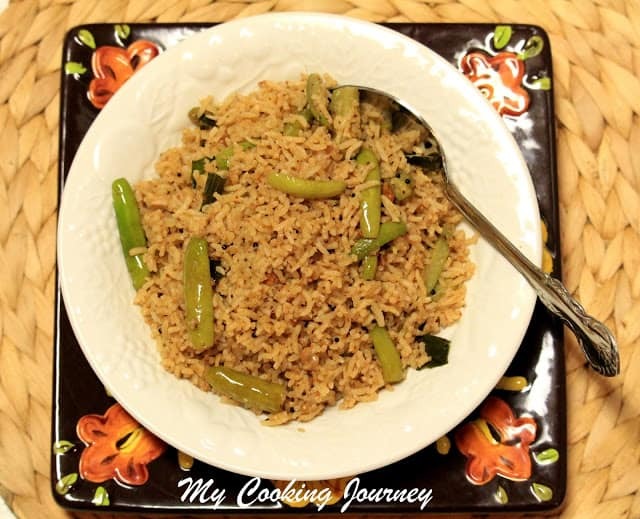 My all time favourite rice dish after lemon rice and coconut rice is karuveppillai sadham, simply love this super healthy, flavoursome rich rice. Drooling here..
Lucky that you have a curry leaf plant at home. Loved all the green dishes this week. 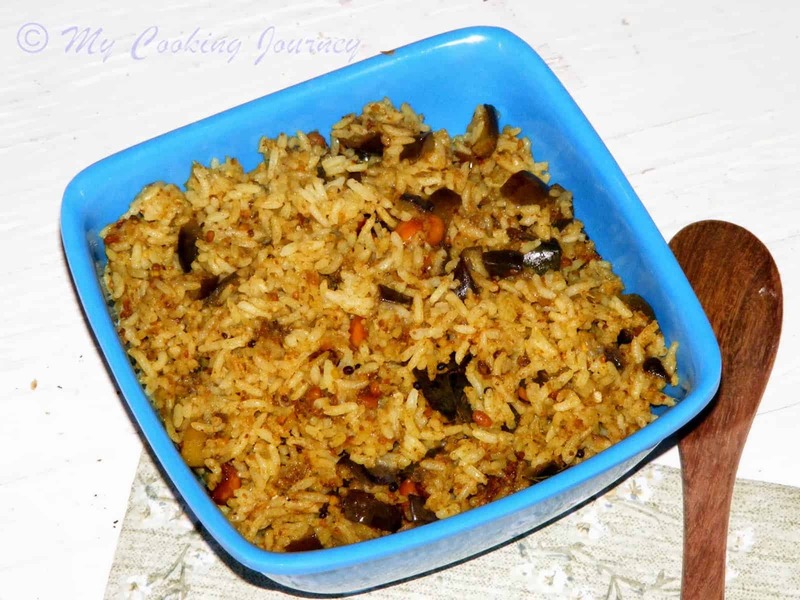 Rice looks very flavorful. Though I don’t make curry leaves podi at home, enjoy it whenever I go home. So can image how flavorful this rice must be. 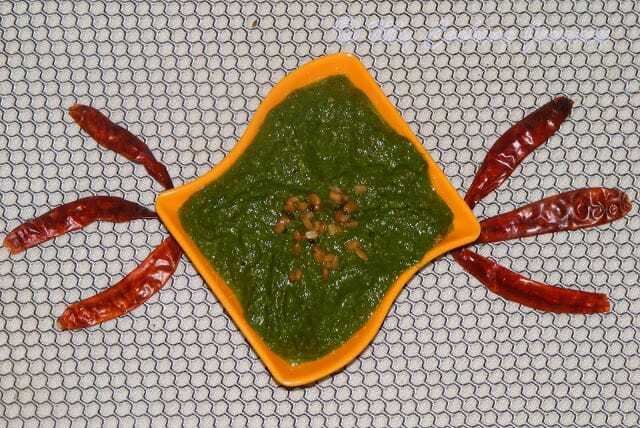 My grandma used to make a delicious curry leaf position and mom used to prepare saadam with that which was our fav during childhood. Looking at yours, I am feeling so nostalgic. 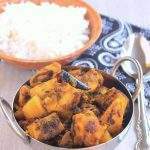 We simply love this rice dish and can have it any number of times..very nicely done Sandhya…I always wanted to have my own curry leaf plant, it never came out..must try again..